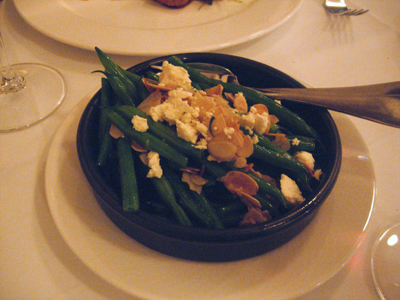 In the spirit of the long weekend, we're off to celebrate at Church Street Enoteca. 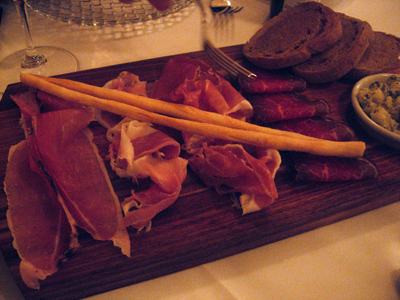 It's impossible to pick a favourite but I will single out the wagyu beef bresaola made in-house. 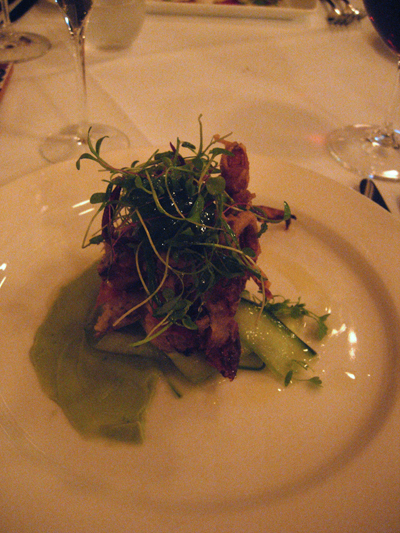 I have one of the specials of the day - soft shell crab served with avocado puree and salt pickled cucumber ribbons, topped with micro greens including coriander shoots. A lot of times soft shell crab can come to the table a bit limp - the crispness disappearing somewhere between the time it was cooked and the time it ended up in front of you. This, I must say, was wonderfully crisp while still retaining the juiciness of its flesh. 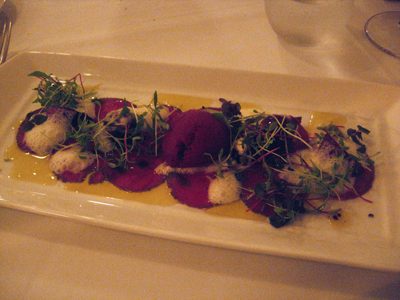 Paalo has the Carpaccio of peppered Hahndorf venison, served with beetroot sorbetto, horseradish cream and beetroot shoots. Another dish that isn't just visually appealing but tastes as good as it looks. 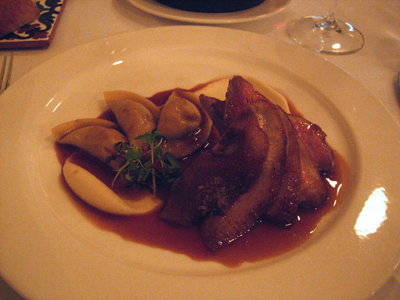 I have the Roasted duck breast served with duck leg and chestnut agnolotti and celeriac puree. 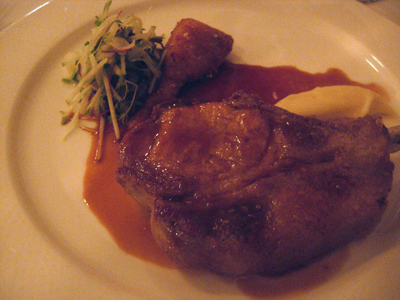 The celeriac puree is silken, incredibly smooth while the duck breast is moist and perfectly pink. Paalo has the Berkshire Black pork rib served with parsnip cream, crumbed stuffed artichoke and a salad of shredded fennel and apple. The parsnip cream had those same silken characteristics - it's almost sinfully good. 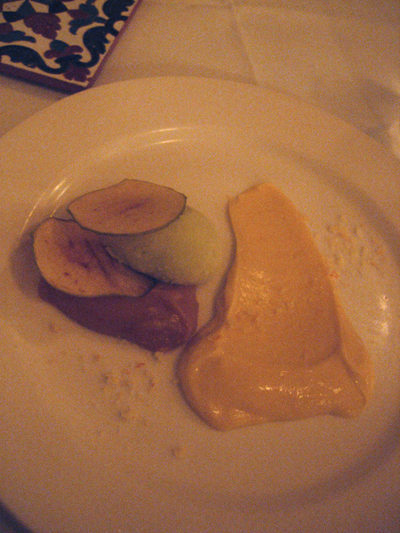 I have the crema strappazzata - cinnamon custard, caramelised apple puree, green apple sorbetto and apple crisps. I think that this dish was missing something solid in the form of a buttery biscuit type component - something like a polvoron. 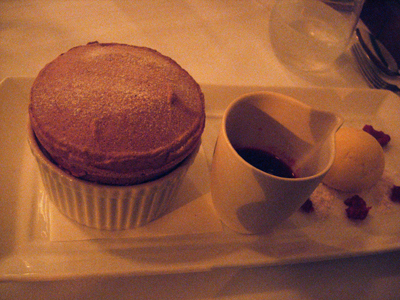 Paalo has the Raspberry Soufflé - served with a raspberry sauce and vanilla bean ice-cream.